Aside from the Arba Kossot on both sedorim, whenever there are large festive gatherings wine is sure to flow. This year I partook of a great collection of potables that showed how far kosher wines had come since the days of my youth, when the choices were extra sweet and even sweeter. 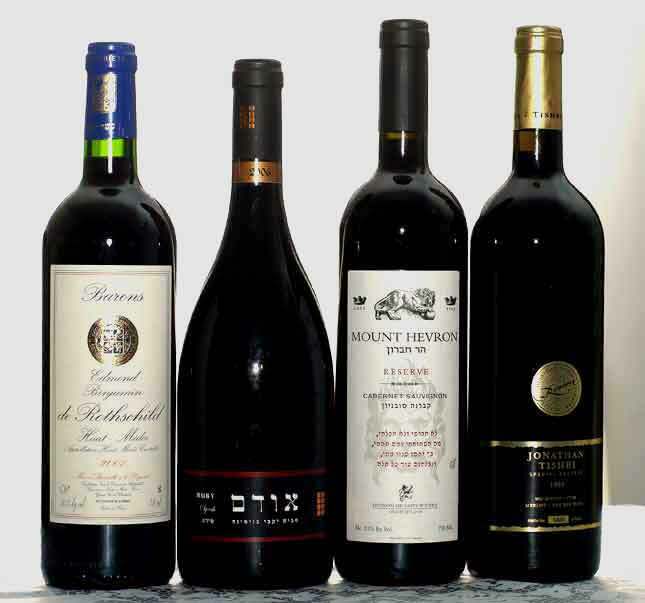 No longer were these wines just from Jewish vintners, but many wineries – already renowned around the world – joined the fray and produced kosher versions of their best sellers. What entails making a wine kosher? Not – as the old joke went – adding a few cups of sugar per bottle, but merely following the standard process under rabbinic supervision. I was privileged this year to taste various superb wines from around the world (which I picked a few days before Passover at Gotham Wines ans Liquors, 2517 Broadway; New York, NY 10025-6934 Tel: 212.932.0990) including some from well known wineries that have already made their mark in the world at large. During chol hamo’ed and the last two days of Pessach, when there were large numbers of people, both at my oldest son’s home in Lakewood (NJ) and at my oldest daughter’s in Providence (RI) I tasted some superb wines which I brought from New York. In the photo above we have a Barons Edmond & Benjamin de Rothschild 2007 Haute-Medoc, Binyamina, 2006 Odem Ruby Series Syrah, Mount Hevron 2003 Reserve Cabernet Sauvignon and a Jonathan Tishby 1999 Special Reserve Merlot. The 2007 Haute-Medoc was superb, complex, yet delicate; fruity and spicy with blackberry accents, it had a long finish. Mevushal. 2006 Odem Syrah had blackberry and black pepper with floral accents on the nose. Full bodied and well balanced it greatly enhanced the lamb dish with which it was paired. Only 5190 bottles were produced. Mount Hevron‘s 2003 Reserve Cabernet Sauvignon offered ripe raspberry flavors finishing with aromatic spices. Tishbi 1999 Special Reserve Merlot, aged for 18 months in oak barrels, it brims with blackcurrant, berries and plum flavors and aromas. Exquisite! Out of a limited, numbered edition we had bottle number 5123. 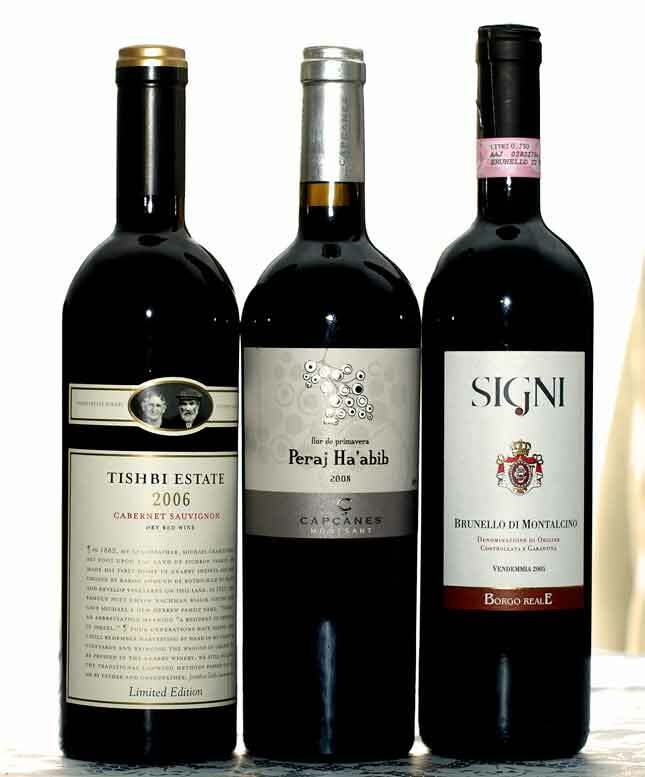 Thishbi 2006 Cabernet Sauvignon Limited Edition is an inexpensive wine that tastes far better than its price suggests. It’s a blend of 93% Cabernet Sauvignon and 7% Petit Verdot. It shows forest berries, blackcurrant, plums, cloves and a bit of green pepper on the nose, followed by sweeter notes of spice and dark fruit on the palate. Moderate tannins complete the rich feel to the long, lush finish. Approachable and decadent. CAPÇANES 2008 Peraj Ha’abib/Flor de Primavera from Montsant in Spain. Robert Parker rated it a well deserved 90. Made from Garnacha, Carignan and Cabernet Sauvignon grapes, it has a deep ruby/purple color. It was aged for 12 months in French and American oak barrels; it displays sweet blackcurrant notes combined with black pepper. 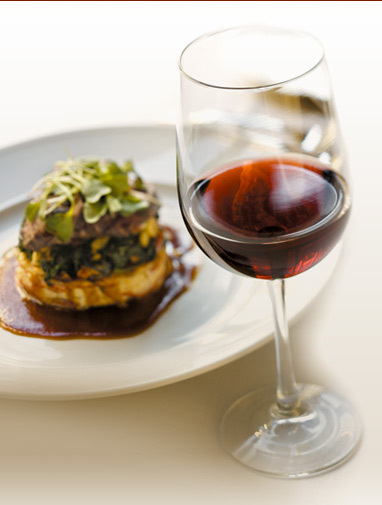 It displays earthy minerals and tobacco on the palate leading to a long luscious finish. Daniel Rogov estimates it will reach its best by 2012 to 2018. I’ve tasted this wine before and through every vintage it seems to get better! Only 1300 cases of 6 bottles each were produced for this vintage. Borgo Reale 2005 Brunello di Montalcino is made from 100% Brunello variety of the Sangiovese grape. Floral and fruity on the nose, its flavor suggests plums, berries and minerals with subtle hints of coffee and tobacco leading to a long finish. Italy’s done it again! For dessert we enjoyed Willm 2008 Gewurztraminer and Balma Venetia 2006 Muscat de Beaumes-de-Venise. The 2008 Gewurztraminer is made from grapes that reach their full potential in Alsace. These wines are far above those of produced elsewhere. Served chilled, it exhibited rose petals and lychee on the nose; on the palate its very, very subtle sweetness combined with the perfect amount of acidity to make it very refreshing. The 2006 Muscat de Beaumes-de-Venise displayed glorious notes of peach, grape, apricot, mango and lychee. We also had it at lunch with a selection of cheeses, this past Monday, its sweetness was balanced by just enough acidity to make me feel I had bitten into the actual grape. Two wines that we finished off before I got a chance to photograph (yes, they were that good!!!) were Barkan 2006 Superieur Shiraz and Psagot 2009 Cabernet Sauvignon. Psagot 2009 Cabernet Sauvignon, It shows deep black fruit aromas awith generous notes of spicy oak, both the brawn, nicely balanced. On the nose it exhibits blackcurrants, berries and figs, those supported by notes of espresso and roasted Brazil nuts. It was a pleasant surprise and far better than more expensive wines, in fact it easily rated among the best I’ve tasted this Passover. Next year may we sip the cup of redemption in Yerushalayim Ir Hakoidesh!